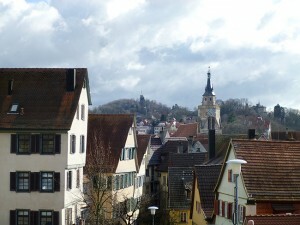 From the window of the Lord’s Chamber (Fürstenzimmer), up in the castle tower overlooking the ancient university town of Tübingen, there is a wonderful view out over the Swabian Jura, cradle of European art. Eberhard Karls University in Tübingen is home to a thriving department of East Asian Studies and also to one of the most distinguished centres of archaeology in Germany. Aurel Stein, pioneering and controversial explorer of the Silk Road studied here, as did Maria Gimbutas who revolutionised the study of prehistoric figurines with her theories about the ancient goddesses of ‘old’ Europe, ideas which informed the Sainsbury Institute’s dogu project and the unearthed exhibition at the Sainsbury Centre for Visual Arts in 2010. We were here thanks to our Robert and Lisa Sainsbury Fellow Werner Steinhaus. Back in 2004 Werner had curated the largest temporary exhibition of Japanese archaeology yet attempted, Zeit der Morgenröte (The Dawn of Time). Over a decade in the planning and long-cherished dream of one of the most influential Japanese archaeologists of the post-war generated, Sahara Makoto, Director of the National Museum of Japanese History, this exhibition comprised over 1600 exhibits from the Palaeolithic to Early Historical times. Werner, born and raised in southwestern Germany, studied at Osaka University in the early 1990s, and stayed on in Japan, now associated with Hiroshima University. I met Werner when I was a Monbusho (Japanese Ministry of Education) Scholar at Kyoto University, during which time I often made the journey to Osaka to visit Jomon sites and meet archaeologists. We have kept in touch sporadically over the years, and have been able to renew our acquaintance through involvement with the bid to have the sacred island of Okinoshima in Kyushu inscribed as a UNESCO World Heritage Site. Over the years the Sainsbury Institute has fostered an extensive network of researchers across Europe, and so we were delighted when Werner suggested we hold one of our regular research workshops in Tubingen. The current head of the archaeology department there, Thomas Knopf, a specialist in the European Iron Age, is very interested in developing links and projects in Japan. Archaeologists from Tubingen have previously worked on Jomon sites in southern Hokkaido, and are now considering a project on the kofun period. The plan came to fruition at the end of March 2013, as a small group of us from Norwich boarded the Eurostar at St Pancras International heading first for Paris, and then on via Stuttgart to Tubingen. 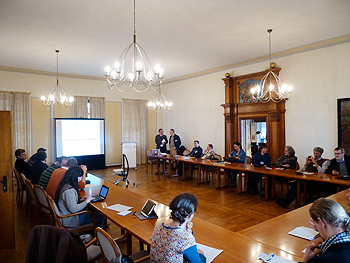 Over the next three days the Lords Chamber of Tübingen Castle was the venue for a series of intense discussions about Japanese and European archaeology and cultural heritage. We began with an introduction to our deliberations by Professor Dr Manfred Eckhart, who led the Department of Archaeology at Tübingen for many years and who remains one of Germany’s the most influential thinkers. Our themes were the archaeology of religion and ritual and, and sacred geography. The presentations ranged from the impact of tourism on Japan’s historic towns to cult practices in India, from the Iron Age princely burial at Hochdorf to the sacred island of Okinoshima. Senda Yoshihiro, Professor of Archaeology at Nara University and currently visiting scholar at Tübingen University presented an overview of the development of towns in Japan from earliest times to the Meiji period. Professor Klaus Antoni of the Department of East Asian Studies provided some invaluable insights into the issues he faced preparing a new translation into German of the earliest Japanese history, the Kojiki (Record of Ancient Matters), which dates from 711-712 AD. Along with participants from the Sainsbury Institute and the University of Tübingen, we were joined by students from the Universities of Freiburg and Leiden. 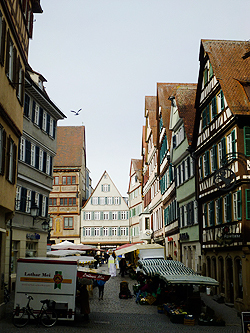 Discussions carried on long after the formal sessions, aided by Tübingen’s many fine hostelries and cafes. Along with Swabian delicacies including the ravioli-like maultaschen, Laugen pretzels and spätzle, helped down with delicious Spätburgender red wine, we savoured the historic atmosphere of the city and visited some of its wonderful museums. These include the University Museum which houses among its treasures the astonishing collection of tiny Palaeolithic sculptures discovered in some of the many caves and rockshelters of the mountains of the Swabian Jura. The workshop itself has already borne fruit. 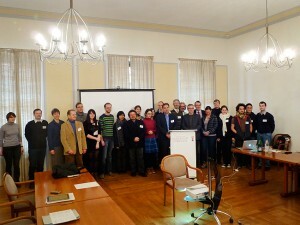 Thomas Knopf visited Japan in May and plans are afoot for new collaborative projects involving the Sainsbury Institute. Around the same time Professor Senda visited Norwich and negotiations are underway for a new agreement of research collaboration between Nara University and the Sainsbury Institute. Ever since the establishment of the Sainsbury Institute we regarded ourselves as a thoroughly European centre of research on Japanese arts and cultures. Over the years we have been involved with numerous exhibitions, conferences and other research activities. The recent changes to the criteria for our Robert and Lisa Sainsbury Fellowships, originally open only to scholars whose primary affiliation was North America, have opened up new opportunities for enhanced collaboration with Europe and other parts of the world. The workshop in Tübingen demonstrated the benefits such collaboration can bring, and we look forward to further developing our European networks. We are very grateful to Dr Thomas Knopf and his colleagues in Tubingen for the wonderful warm welcome and stimulating intellectual environment.